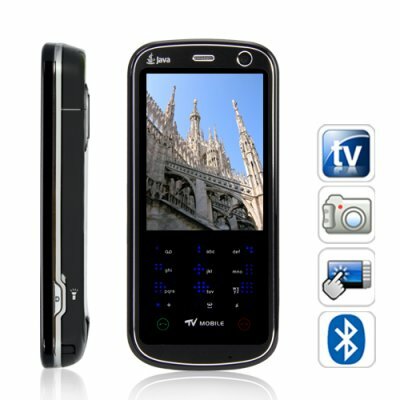 Successfully Added Milan - Touchscreen Cell Phone with Dual SIM and Smooth Keypad to your Shopping Cart. Meet the Milan Quadband Cell Phone, an all-in-one China Mobile Phone that perfectly combines power, performance, and price. Be amazed by the Milan's many functions and features, be stunned by the high quality touchscreen and unique smooth number keypad, and then be thrilled at the amazingly affordable wholesale price. Housed in a sleek black cover with silver borders, the Milan Cell Phone feels as good as it looks and is excellent for everyday use. In the middle is a highly accurate and responsive touchscreen that can be used with your fingers alone and will amaze you with its precision. The bottom of this Quad Band Cellphone holds a smooth number keypad that is as cool as it is convenient and makes texting and dialing numbers an amazing experience. Full Multimedia: TV on the go, dual cameras, image viewer, video recorder, video player, audio player, sound recorder, FM radio - the Milan cell phone has it all! Best of all, a free 2GB TF / microSD card is also included so you've got lots of storage to create and play media! All the Essentials: Java, Bluetooth, Games, eBook reader... the Milan Cell Phone has something for everything. Best of all, search for your favorite Java applications and games online and install them onto the Milan, making this amazing phone truly yours. Smooth Keypad: The classic keypad gets a twist with the Milan's new smooth/invisible touchscreen-integrated style. Text input and has never been more accurate, or stylish. One of the easiest and most unique cell phone you will ever use, Milan was made for today's busy lifestyle and will cater to your every need, whether you are a corporate executive or full-time parent. This mobile phone is expected to be one of our top sellers and makes for a great resale item due to the combination of high quality and low price, so be sure to get your inventory now! In stock for single piece or large bulk purchases, order it today and we will express ship it out within 24-hours. Does Milan come with an analog TV tuner? What is Dual Standby and does Milan have it? A phone which is designed to work with 2 Subscriber Identity Modules (SIMs) are called Dual SIM phones. Of these Dual SIM phones, the ones which allow both SIMs to be active at the same time so you can receive calls on both are called Dual Standby phones. Yes, Milan is a dual SIM, dual standby phone.